Podere Tina marries antique with modern. Wherever possible, traditional building methods and local materials were used for the restoration: terracotta floors, wooden ceiling beams, whitewashed plastered walls and some antique detailing. The quest for historical authenticity in no way confines comfort and tasteful luxury. This is apparent in the furnishing of all our apartments, which are fitted with central heating and have facilities for telephone, fax and the Internet. They are also equipped with a stereo, video and satellite television. 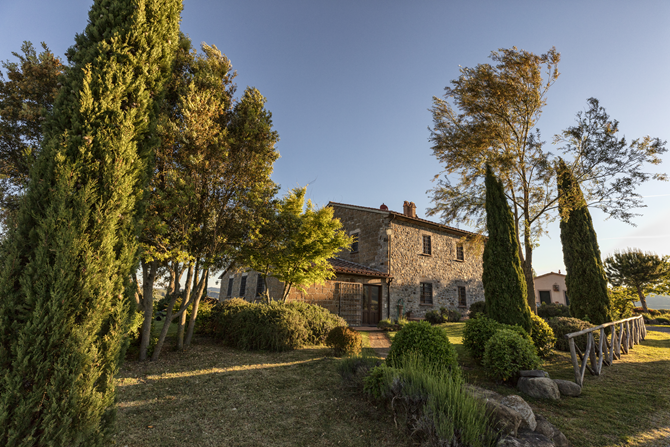 The farm comprises two separate luxury apartments: Tinaia on the ground floor, with a wine room (Cantina) and veranda (Portico) and Pergola on the top floor. The stable has been converted into the small apartment Vignaiola, and can be extended with a bedroom due to the adjoining multi-use space. Special facilities make this room suitable for people with disabilities.